Honestly, I've only glanced at dive shops, haven't really taken time to look at the facilities of the dive shops I've passed by whenever I travel to tropical countries, but the dive shop in Aiyanar is quite impressive. The diving facility was replete with oxygen tanks, masks, hot showers, BCDs, wet suits, clean towels, cleaning areas, a camera room, and everything you will need for a fun diving session. Everything was kept clean and orderly for divers, even for first timers like myself. The resort has its own boat to take divers to various dive spots in the area. Just before lunch, we were briefed about diving and the things we need to do while underwater. 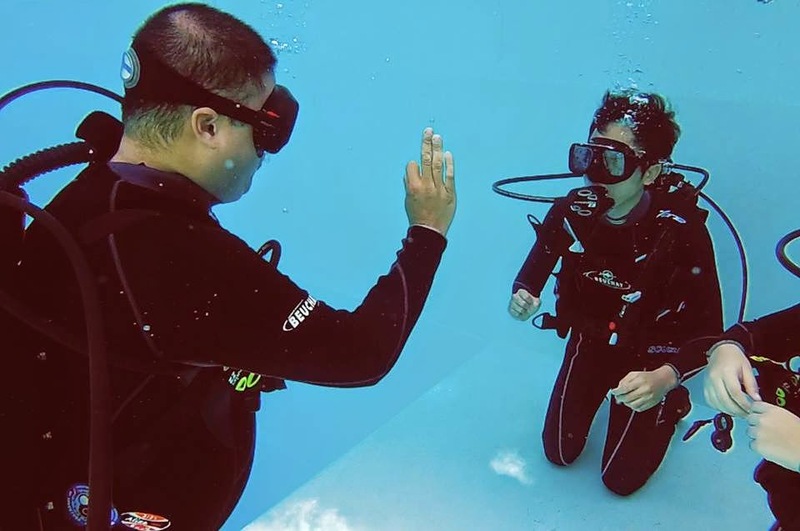 Our dive instructor, Marco, discussed the dos and don'ts of diving. I realized that it takes a lot of preparation before one gets in the water. But before we tried our sea legs in the ocean, we were taken to the resort's pool to prepare. I liked how our dive instructor was very thorough. Unless you're Aquaman, speaking and breathing underwater is out of the question. We were taught different hand signals, what to do in the event that you lose the regulator underwater, why one should always breathe even if you suddenly lose the regulator underwater, always check your air levels, why equalizing before and every time one goes deeper is important, and why it is important to use your mind to call upon the creatures of the ocean in the event that you run out of air, aside from the last one, Marco taught us all we needed to know for diving. I know how to swim, but diving is a different kind of animal. One of the exercises took us to the bottom of the pool. If I'm not mistaken it was around 15 ft. I felt like I was in an airplane taking off or landing, but only underwater; equalizing even before you start feeling pressure in your ears is important, lesson learned. As unlicensed divers, my partner Trish and I were not allowed to take photos or videos of our dive. The only people allowed to take photos or videos were the dive master with us and the other licensed divers (our other travel blogger companions) that came with us. 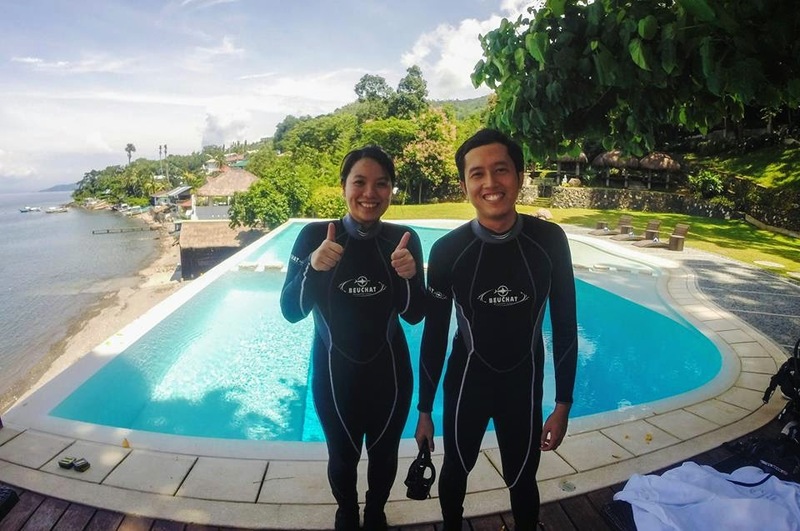 We dove in two different locations around Anilao, for around 30 minutes each. I only managed to snorkel at the tropical destinations I've visited, but diving is a completely different world. You get to see more of the action up close and personal. We got to see all sorts of table corals, hard corals, and soft corals that covered the spectrum of a rainbow. There were also all sorts of fish that swam around us as we got deeper. Ariel, Sebastian, Flounder, Poseidon, Aquaman, and the cast of Little Mermaid were all there. Kidding aside, I couldn't exactly tell the different types of fauna swimming in the depths of Anilao. My knowledge of underwater sea life is limited to names of fictional characters in cartoons, comics, and pop culture. Our dive instructor, Marco, was with us throughout our 2 discover scuba diving sessions. He taught us the ropes and frequently asked us if we were alright during the dives. To succinctly describe how I felt during the dive here is a link to a video: https://www.youtube.com/watch?v=GC_mV1IpjWA. Address: Sitio Looc, Barangay Bagalangit, Mabini, Batangas, Philippines. For more information you can visit their website www.aiyanar.com. *Disclaimer: This is a sponsored post but all views and opinions are my own. This is a great experience to try with friends. What underwater camera do you suggest? Congrats on your first Scuba. It's one of the things I have yet to do. Congratulations! Even as a child I've been dreaming to scuba one time. I'm sure it was more than enjoyable. OMG! Aiyanar is one of the places I want to visit next Summer!! I don't think I could do scuba diving, though. Congratulations you were able to do it. Thanks for sharing this useful post. Usually, those who engage in scuba diving careers were snorkeling lovers who wish to take their activity a little further. Scuba diving couldn't possibly be compared to other opportunities.